It’s time for another giveaway, this time the luxury hybrid DreamCloud mattress! I just recently reviewed the DreamCloud, and boy is this winner lucky! Great feel and great support for all sleeping positions – plus winner chooses the size! DreamCloud is a thick hybrid mattress that I found to be a bit firmer than average, though still offering good pressure relief and support. The mattress has a good bounce to it, feeling almost a bit more like an innerspring mattress than your average hybrid bed-in-a-box. Learn more about the DreamCloud in my full DreamCloud mattress review. Also, check out where the DreamCloud landed on my best hybrid mattress picks! This would be such a blessing to win! No more sleeping on the floor. Thanks so much for the chance! It sounds heavenly like sleeping on a cloud. we need a new mattress ours is giving me a backache. I need a good nights sleep. Thanks for this anazing oppurtunity! Keeping my fingers crossed! It sounds like a great mattress. I like the quality construction and support. I think the DreamCloud mattress looks very nice! I’m a side sleeper. Looks like a great mattress for sleeping on side. This mattress sounds amazing! It sounds perfect for my needs! This is in my top mattresses that I’m thinking of trying. The whole year to try the mattress is a big selling point! Though i alternate from back to side in the night, so hopefully it’ll work for my side sleeping. I have an old mattress that sinks in the middle. I can feel the springs when I lay down. Ugh. This dreamcloud mattress looks like a dream. Better sleep I bet… and better dreaming too. These mattresses look very comfortable and soft. We bought the wrong foam mattress as I have a bad back it’s not helping me. Thank you for the chance. This mattress is just what I need for a good night’s sleep. The DreamCloud Mattress sounds absolutely wonderful, especially compared to my current mattress. I think I would get better sleep and have less pain when I wake up. I think it looks extremely comfortable! Would love to own one! Looks amazingly comfortable. I would get a good night sleep. I would love it! Thank you! Looks so comfy! I would love to win this mattress. I could use a good night’s sleep! This looks so comfy! I think this bad boy would be a perfect fit for our home! With the combination of high-density foam with encased coils, I think this is going to spoil me! Thank you for the chance to enter. Fingers crossed! Thank you! It looks amaze balls and I need to get one! This Dream Cloud mattress looks and sounds phenomenal! I would love to win this generous giveaway! This mattress looks like heaven to me ! .I never sleep good and constantly have neck / shoulder and back issues. I’d love to try out this mattress! My husband has a terrible time sleeping on our current mattress. I bet I’ll get rid of a lot of my back problems sleeping on this mattress. My fingers are crossed. Thank you for the chance to win. I think this mattress is a wonderful idea and it looks so comfortable! I think that having a DreamCloud mattress would be a dream come true. I would love to have a mattress that does what it says it will do, my mattress is not allowing me to sleep, it keeps me up most nights. Seems like you have a decent product. This would be amazing thank you for the chance. Quality mattress – looks like it would be just the ticket! I think the DreamCloud mattress is fantastic and it would be the perfect mattress to own. I’m sure about the edge support, but this looks like an overall great mattress! I’d love to test it out for myself. I need a new bed badly. I think it sounds very supportive and comfortable. I think it looks luscious. I think it would really help my hubbys and my back..
Oooh! It looks so comfortable. I’d love to try it out. I think it looks like a great mattress! I love this mattress. It looks incredibly comfortable and affordable. I researched for months reading endless reviews, laying on mattresses at stores, and learning more about the types of memory foam than I ever wanted to know. The thing about this mattress looks very soft while still being supportive. I would love the chance to win this and finally have the sleep that I deserve. I love how this Dream Cloud mattress is a hybrid and also love the temperature feature so I wouldn’t get to hot while sleeping! I would choose a queen size! This brand is new to me. I usually go with a firm mattress but learned that in a hybrid like this one, firm is too firm for my back issues. These mattresses on your site look so so comfortable and great back support. Thanks for the giveaway! Really needing to upgrade our mattress. I would be so grateful and appreciative if I won this bed!! I’d take it in a twin! Right now I’m sleeping on two old twin mattress’ on top of eachother, n the bottom one is Brooke with springs hanging out of it. So uncomfortable. I already have back problems and this isn’t helping! I wake up so stiff that my back can’t move! A new bed would feel like heaven. Thank you for the chance!!! It looks so comfortable! Great review, I’d love to win! This mattress looks like the problem to my insomnia!! Love it! This mattress looks like just what I need to finally get a restful night’s sleep. I sure need one one those beds my back keep me from sleeping, thanks. I want this mattress !!!!! WOW!!! What a tricky looking mattress!!! I thought for sure this was an inner-spring mattress!! Looks & sounds like it’s built well. Comfy for side & back sleepers, which is good for us! Love the Dream Cloud! Thanks for the great review!!! My old mattress makes my back hurt so this DreamCloud mattress would make all my pain go away and be like sleeping on a cloud,it looks so comfy! The DreamCloud mattress seems like a great choice. It looks thick enough to handle two sleepers without making too much of dip. I would love to have a hybrid mattress and the Dreamcloud mattress looks to be a winner!! This is an amazing bed and I would absolutely love to have this! What do I think about it? I think I want to sleep on it :). King size please :). I like that it has foam and coils. It seems like an exceptional mattress. This looks like an amazing mattress! This Dreamcloud mattress looks very supportive! MY KING MATTRESS IS HEAVY AND OVER 10 YEARS OLD! I CAN REALLY REALLY USE THIS! It looks very comfortable and durable and I would love to own one. Great looking mattress my back needs a new one! Its incomparable..in comfort, style and price, What more could you want in a mattress? This mattress looks very comfortable. I have a Puffy Mattress in my guest room and would love to have a Hybrid mattress for myself. I need one that does not have pressure points. looks heavenly – my pregnant body needs this! I think the design will allow for a long term use. I am so interested in this mattress! Of all the reviews for mattresses I’ve read this is the one I’m most excited about. I like that it seems firmer than many newer bed options. We are overdue to replace our 20 year old mattress! This looks like a very comfortable mattress. This sounds like something my husband needs for his fibromyalgia! Oooh. I would love to win this! But now that I’m checking back (no longer on my mobile) I see that this promotion is not available in my region. Lot’s of great information… thanks!! Looks like a great mattress. Looks very comfy. Unlike the old one I have now. 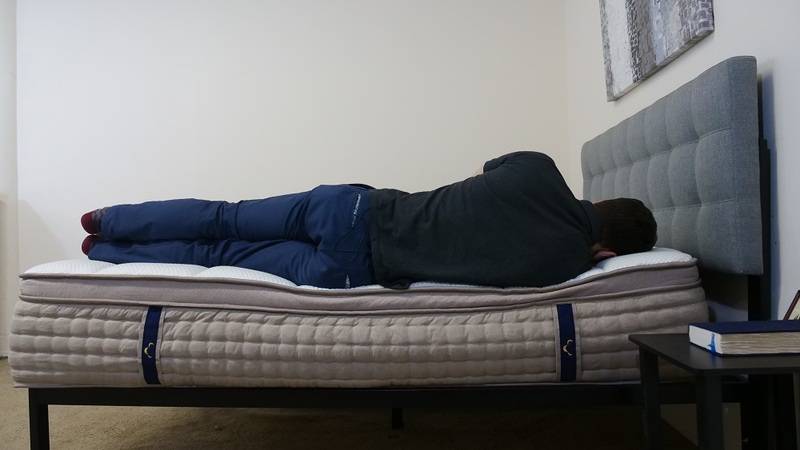 Wow, that mattress looks very comfortable… thanks for a great review and for the chance to win it! 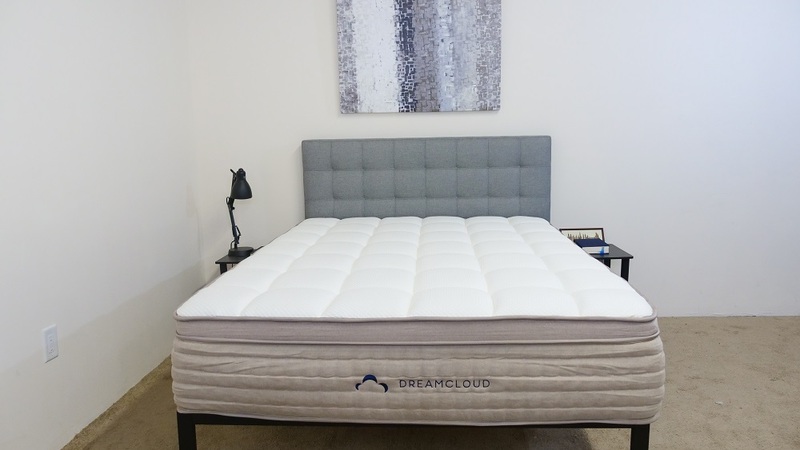 I think I would like the DreamCloud as it is a hybrid, I am not yet ready to give up springs, good for side sleepers like myself. Thanks! I would LOVE a new mattress!!!!!!!! Mine is over 50 yes old!!!!!!!! It looks like a great mattress for getting a peaceful night’s sleep. The DreamCloud Mattress looks so comfortable. Wow, I would love to try this mattress out! Love hybrid mattresses and I like a firmer feel so this would work out great for me! My hubby prefers a firmer mattress so this would be perfect for us. Love all of the great features it offers. Oh man! Sounds like this might make my old lady hip feel better! Thanks for all of the information and the chance! Your Mattress looks so comfortable.It would help me with my dis functional body. Thanks for a chance to win. looks good. We’re looking for a hybrid mattress. I might be sold on this one after months and months of research! Thanks for the great reviews! This mattress looks pretty great! I would love to replace the crappy Costco mattress my mother-in-law insisted on buying for us with this one. It seems like a really quality mattress for the cost! This mattress looks like something I’ve wanted but could never find. That would be heavenly if I could win this nice comfortable Dream Cloud Mattress! This is a very nice looking mattress. Would like to own it. No whammy. No whammy. No whammy. STOP! I can’t wait for your Bear hybrid techie. I so need this. I’m using a borrowed one with springs sticking out. This would sure be a blessing. It looks so comfortable can’t wait to win one. It looks like just what I need. My old mattress is killing my back. I would be interested in your opinion about mattress that might be best for my husband and me. I am 5’4″, 120 lbs side sleeper who likes a softer feel, my husband is 5’9″, 160lbs and is mostly a stomach sleeper, but also side – he prefers firmer. We are leaning towards a hybrid mattress such as this DreamCloud. What are your thoughts? This looks like a good mattress. The mattress looks sooo comfortable! The DreamCloud mattress looks very comfortable and very well made. I’d love check out the innerspring feel of it! Ask me again after I’ve had a chance to sleep on it. I want a DreamCloud Mattress! It’s the perfect fit for me! I’d love to own a DreamCloud mattress! Perfect fit for me! It looks like it is a good mattress. AS always, comprehensive and informative. I like like a like “cloud nine”…so comfortable! It seems like the perfect mattress to finally help me get the kind of sleep I deserve. This looks nice. Thanks for the detailed review. This mattress seems like it would be comfortable and supportive. A good mattress is a necessity. Just what I need! The perfect bed for me! My back is screaming for this mattress! It sure looks like a winner! I love this mattress and haven’t even laid on it! It sounds like a real high quality mattress. My body could definitely have comfortable sleep after a hard day of dealing with many chronic illnesses. Thank you, for hosting such an awesome giveaway. This is my dream mattress and I wish all of us bloggers who entered could all win one. I like a firm mattress so I would love this. It sounds like a great mattress to get a restful night’s sleep. Could use a new bed mine is broken and I don’t have the money to replace it. It looks like i might need this mattress i sleep on my side and hate stiff as a board feel, my current mattress is over 20 years old and I’m looking for a great deal. I love the review, this looks like a great mattress. it sounds perfect for me, i need a new mattress very badly. I’d love this mattress, ours is only 6 years old but says something awful and with my messed up body, I wake up in pain every day. I mean, I’d wake up in pain regardless, but the mattress makes it much worse. There is a huge difference between tolerating a mattress and loving one. A mattress you love is worth a big price tag. Good sleep is critical to everything else we do. Thought my first thought was YES! !, after watching the video, I may reconsider and look at some other reviews. Thanks!! It looks so nice and would be great for not having the shoulder and hip pain. Wow. These mattresses look fantastic! Thank you for providing the thorough informational online review/demonstration video. Could really use this win. I need a new king bed all for me 😁 I’ve had back problems when I was pregnant with my son on my bike. Docs say it’s muscle spasms. I hope to try win to try this bed. Hoping to win! God only knows how bad me and my husband are sleeping at night on our current mattress! I love the review on this amazing mattress! I think it seems dreamy and I would love to win one!! It sounds really good. I like that it is a thick hybrid mattress. Maybe if I had one of these I would get a good nights sleep. Boy does that look like heaven! I sleep on the couch, because I can’t barely move after a night on our 4 year old mattress. Because I was in bed when I saw this, it looked so comfy, I fell right to sleep. We have been shopping for a new mattress but have not made up our minds yet. Our mattress is about 15 years old and very uncomfortable. We do not get restful sleep. The dreamcloud may be an option for us. I’ve always enjoyed traditional coil mattresses. But these hybrid mattresses add comfort and support. DreamCloud builds comfort for me. Looks like a Fantastic Mattress. What a Great Giveaway. OMG this sounds amazing, I don’t even remember what a good night of sleep feels like, our bed is so old and lumpy, but one day soon I will have a new one, and winning one would be the best experience with a new bed ever!!! The mattress sounds very good and we need a good mattress. My husband is waking up with a back ache! I like mattresses more on the firm side and this looks more plush, but I’m in the midst of moving and may consider hybrid mattresses. Thanks. Would love to win a new mattress, and this one looks like a winner! The pressure mapping looks great! Love that the name fits the look of the mattress it really does look like a dream cloud! Gonna shoot my shot at getting a free bed. Really would like to try this mattress. Hi,me and my husband both have bad backs.hes had two back surgeries,and broke in between,he had a M.R.I.done showed his lower disks gone,and his spine is crooked,so most defiantly need new mattress,can’t afford to buy.thank you . Might be what I need. Our mattress is 25 yrs. old…Really need a new one but don’t have the money to get a new one..They look like really comfortable beds especially when my wife and I both have extreme arthritis…In it to win it…Good luck for comfort to everyone!! After 3 major back surgeries I’ve had 3 mattress’ and none of them have helped with the pain or with my sleeping. Or should I say my none sleeping? Thank you for the chance I sure hope I win. It looks and sounds good, but also looks kind of on the side of too soft when someone lies on it. I’m thinking this mattress is perfect! But, also am thinking about the price. I really appreciate the opportunity to win. My mattress dips and sags. Sounds like a great sleep! The Dream cloud mattress sounds really nice. I would love to try it. It would be such a blessing to win it. My back appreciates the opportunity. Good luck and God bless everyone. Sounds and looks totally dreamy! I’ve spent the past few months all over the place trying to find a desperately needed new mattress due to how ancient mine is and severe back issues. No success yet, having the hardest time finding one soft as I need with good support but not too firm. I’ve been on my couch way too long during this, would love to try this one! Would love to win this luxury hybrid mattress by DreamCloud! My back would sigh at the support that only a mattress of this quality can deliver. Sounds like a good idea to get this DreamCloud Mattress. WOW! Sounds perfect for me. Would love to have one! The DreamCloud mattress looks so comfy. It would be really dream come true to win it. I could definitley see myself with this matress. Comfort at it’s finest. I would love to win a DreamCloud mattress. I’ve had back surgery and I’m now going thru nerve burning to control the pain. It would be great to have such a wonderful mattress. Thanks for the opportunity. The eight-layer construction is great for back and stomach sleepers. It gives great support for a good night’s sleep. I’d slap my momma for this mattress! Looks comfy; would love to see if it lives up to its name. The eight-layer construction and encased coils makes for a quality mattress indeed. Hope I get to find out for myself. I didn’t mean to follow on LinkedIn! Hopefully you can remove that entry! Amazing! I think this is the closest I’ll get to sleeping on clouds! The DreamCloud mattress looks really comfortable! I would love to win this prize because our mattress is more than 10 years old and not very comfortable anymore! Even the name sounds restful!! I really need a new mattress, this one sounds amazing!! Had me at cashmere polyester blend, wow. This mattress, from cover to wrapped coils, seams to be the ultimate in luxury. Informative demonstration on how the bed is made makes this mattress even more desirable. Would love to have this to replace our old (35 years) set, espically before our 50th Wedding Anniversary in June, thanks!! would love to have this to replAce our marress which is (35 years ) old!! Sounds wonderful. Would love to try it. Banging my wife… Dats da plan! Looks comfy enough that the name is quite fitting. Gee, who WOULDN’T want to win?! My dreams would come true if I won. Really need a good mattress. Wow Looks like what I need for my back, and hips. support with no pressure. I would love to sleep on this! Thank you for another giveaway! Does the tufted top of this mattress end up leaving a body impression after a period of time? When a mattress gets this thick it’s hard to find sheets that fit. I need a firmer mattress, this may be the one! Wish me luck. This mattress sounds wonderful. I sure could use a new one. I’d love a new bed! Thank you for the chance of that dream mattress for the best dream night sleep! Looking for a hybrid mattress–this one looks interesting. This mattress looks super comfy. I need such mattress who combat my back pain. DreamCloud is the perfect name for this mattress! It looks comfortable & made of quality ingredients. Sounds great, exactly what I need. I would love a nice new bed I can get comfortable in. Love your review! I need a firmer mattress, this one looks good for that! I would love to win! We desperately need a new mattress. Love the looks of the mattress and that it doesn’t sink so much. Looks very comfy! We want to pull the trigger on this bed but I’m debating between the DreamCloud vs Puffy. I’m a side/stomach sleeper and my husband is a back sleeper. We currently have a memory foam that lasted less then 6yrs. :( Hard decision! Thank you for the amazing chance! Would be so thankful to win! Great review! My husband is a stomach sleeper and would love this! I like that it is a slightly firmer mattress. It sure looks very comfortable! This looks more like what I’m looking for than most others you have reviewed. Would be perfect for me! looks way more comfortable then what i have. I love the cushion on the top- it looks very comfy! This looks like a seriously good mattress. I’m dreaming of winning this DreamCloud Mattress. This mattress sounds like a dream! I would love to win this mattress! It sounds so comfortable and well constructed! Whoever wins this is truly a very luck person!! Good luck everyone!! Definitely need a better mattress. The one we have now really hurts my back and hips. I have been sleeping on the couch instead for months now. Firmer may be better for my back. I sleep on my couch every night. The mattress I have now is from IKEA and it is over 10 years old and kills my back. I would love a new mattress so I could start sleeping in my bed again. This would be a blessing! I am really loving the dreamcloud ! its awesome when there is springs and the top layer to boot ! I am amazed that it is really a bed in a box..
especially as tall as it is .. Sounds like an amazing nights sleep! Thanks for the chance would love to replace our old mattress and get a good niggts rest! I think it is a very comfortable mattress. after reading the review, I would love to sleep on one. Looks extremely comfortable for a back sleeper. I would love to have a new bed – Had mine for 20 years ! WOW, this sleepopolis dreamcloud sounds like something I could really use, especially all the features for your back!!! Looks like a well designed mattress. I happen to be looking to purchase a well made, high quality mattress. Sleepopolis (love the name) just gave me another one to add to my research list! Thanks! This looks so comfy! The mattress I have is awful on my back. Like many other people, I really not just want but need a new bed. I’m hoping I win, but regardless thank you for offering this opportunity. Good Luck to Everyone! Would love to win a mattress. Looks good. The dream cloud mattress actually looks like a mattress that would not only fit my budget but also give me a comfortable night’s sleep. This mattress looks so comfy and luxurious. I would love to win this mattress for my daughter, it looks like it would be so comfortable, not too soft or too firm, just perfect. Thank you for the chance! I want a firm mattress and the dream cloud sounds like a winner. I appreciate the way it is a hybrid and with 15″ of construction it has all the features built in it. The temperature feature so one doesn’t sleep hot at night is also very important. It looks like an outstanding and comfy mattress. Definitely one on which I’d love to sleep. I think the DreamCloud Mattress is wonderful. This looks very appealing and would be most welcomed in my bedroom. Thanks for all of the Cool promotions Sleepopolis. They are great and well appreciated. I love the name and sounds luxurious. Can’t wait to sleep on this! I could use a good mattress. I’m super excited about today’s opportunity thank you. Wow, this mattress looks like it would be a marshmallow. Very comfomfy. need it more everyday, thank you for the chance! This sounds like the perfect mattress! It sounds like it’s something I need and want. It is very hard shopping for mattresses. Looks so comfortable and not hard! This dream Cloud mattress looks wonderful sure would love to sleep on it.i have meddle in my back so I’m always moving around I just need a comfy bed so I can get some sleep. Wow this is amazing!! in need of a new mattress, would love to give this one a try! I love the fact that it feels like you are sleeping on a cloud. Looks like a nice mattress – like the idea of coils..
I’m seriously in need of a new mattress, but I also have never really been a fan of spring mattresses. I’d love to try a memory foam or hybrid mattress. I wonder how this one would hold up – especially with three Coonhounds that sleep on my bed every night. They tend to “dig” on the bed to make a nest in the blankets and such, so I always keep a mattress pad on. Thanks for the thorough review. It sounds like it is a good balance between cushion and support. I need a new bed. We had an apartment fire over 12 years ago and a used mattress was given to use. We have not been able afford a new mattress yet. I like the 15″ height and the top comfort layer. Looks comfy for sure! Your information gives me the idea that this mattress would be perfect. I once had a very nice bed, but ended up giving it to my dad after moving back in with my parents to recover my savings thanks to some fairly disastrous life things (his bed hadn’t been replaced in ages anyway). It’s great for my dad, but my new bed is a fairly uncomfortable and small twin. Would be nice to have a comfortable and bigger bed again even if I don’t have the room for it. It looks almost futuristic/space style. Although I don’t know why they would need then in space. Regardless, it looks comfortable enough to sleep on! Have always needed a new mattress, would love this one. The DreamCloud mattress sounds absolutely dreamy. This mattress looks sooo comfortable!! My mattresses over 20 years old and I’m not sleeping well at night. I think I need a new mattress this will do wonderful! Ibwould love to win this. Me and my husband both have a 10 yr old mattress and we have suffered from stiff neck, and mid back pain. Hubby says his side of the bed has a spring that pokes him. This mattress looks heavenly. Mine is old as dirt and so worn out. We could really use this! It sounds Great! Just what I need!